Farmington High School students recently built 2-year-old Cillian Jackson a power wheelchair from scratch after learning his family’s insurance wouldn’t cover the cost of the chair. Cillian has a genetic condition that makes mobility difficult, with symptoms similar to cerebral palsy. 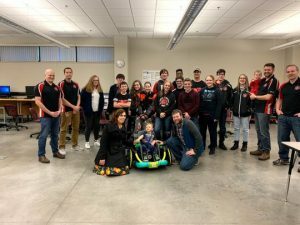 After determining that the family couldn’t afford a wheelchair (they can usually cost up to $20,000), Tyler Jackson, Cillian’s father, contacted the robotics team at his former high school. The students were excited to help. They spent a few weeks creating a chair made out of a Power Wheels riding toy by replacing electrical components, mounting a seat from a bicycle carrier and designing a joystick with a 3D printer, KARE reported. A program at the University of Delaware designing mobility devices for disabled children gave technical assistance, but KARE reported the students used the skills they had learned from building competition robots to create the custom-made chair. The Jackson family visited the students after Cillian had been using the chair for a few months and he was able to wheel around the classroom and show them what their hard work and kindness had helped him achieve. Read more about this story on USA Today’s website.